UPDATED: Fri., Nov. 23, 2018, 9:33 p.m.
With injuries sidelining two of their best players, the Spokane Chiefs have recently pivoted toward youth more than they anticipated at the start of the year. But Riley Woods, one of the team’s three 20-year-old players and now the team’s top-line center, has excelled all season. 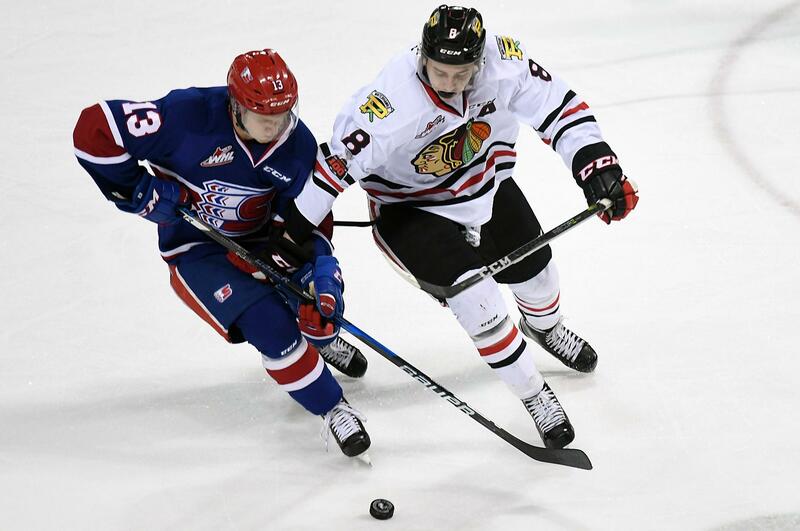 His steadying presence has the Chiefs still in the thick of the U.S. Division of the Western Hockey League, heading into Saturday’s game against Kamloops at the Arena. Woods spent most of his career as a wing. But between a stint in the NHL and more recently an injury, center Jaret Anderson-Dolan has played just two games for the Chiefs. That has kept the 5-foot-10 Woods on the top line, consistently facing off against opponents’ best centers and defensive pairs. In just about every statistical aspect of his game, Woods is doing well. He has played all 23 games and leads the Chiefs with 18 goals, including seven on the power play and two winners, and his 33 points rank ninth in the WHL. His plus-13 is best on the team and illustrates his impact on defense. Lambert said Woods, a bit undersized, has become a good 200-foot center, meaning he is focusing on defense first, and allowing that to create scoring opportunities for himself and his teammates on offense. Woods’ 1.43 points per game is almost double his average from last year (0.79). He is also winning faceoffs at rate of 57.5 percent. The effectiveness of the McIndoe, Woods and Carter Chorney line has been particularly important because of the injuries to Jake McGrew (out with a concussion) and Anderson-Dolan. Anderson-Dolan, a Los Angeles Kings prospect, opened the season in the NHL and played twice for the Chiefs in late October. But he suffered a wrist injury that required surgery, which he had in early November, according to reports by L.A. Kings Insider Jon Rosen and TSN’s Bob McKenzie. “Right now, it’s one of those things where the body’s going to heal how it heals, and we’re not going to rush him,” Lambert said of Anderson-Dolan’s injury. In the meantime, the Chiefs are playing three 17-year-olds among their top six forwards. That includes Adam Beckman, the left wing who is second on the Chiefs with 10 goals, Chorney, who is third on the team with eight goals, and Luke Toporowski, who is tied for fourth with seven. Heading into their home game against the Kamloops Blazers (8-10-2) of the British Columbia Division, the Chiefs (12-8-3) stand third in the U.S. Division. They are coming off a 3-2 overtime victory at division leader Everett (17-7-1) in which Woods scored all three goals for his first WHL hat trick. When the Chiefs get McGrew and Anderson-Dolan back, the experience of the 17-year-olds bodes well for their depth. They will also continue to rely on Woods, who wasn’t drafted by the NHL but said he hopes that next year he can play in the American Hockey League. Published: Nov. 23, 2018, 3 p.m. Updated: Nov. 23, 2018, 9:33 p.m.